You are ready to get into a vehicle with a look that makes you excited to drive it. Consider the popular SUV that is the Jeep Grand Cherokee and get to know all that its exterior has to offer! The seven-slot grille on the Jeep Grand Cherokee is something that sets it apart from other SUVs that you see driving around and it something that helps people know just what you are driving. 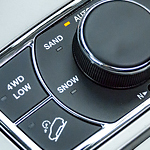 There are multiple wheel options available for the Jeep Grand Cherokee, and each of those wheel options helps to give the vehicle a unique appearance. You should be in a vehicle that you are proud to drive and that others admire. Charbonneau Chrysler Center is here to show you just how beautiful the Jeep Grand Cherokee is. Come to our new Jeep showroom to get a look at this vehicle and to test drive it to see if you would like to own it.